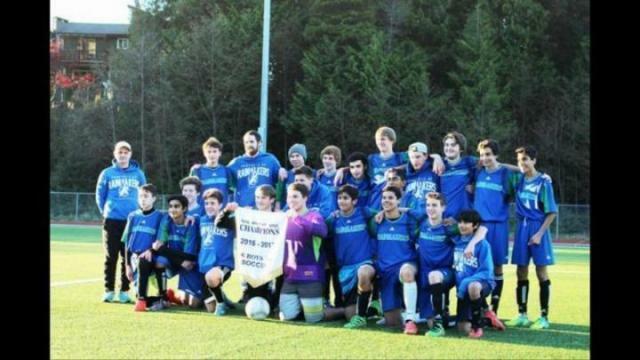 The CHSS soccer boys are NorthWest zone champions thanks to a strong showing in Prince Rupert last Saturday. The boys beat Kitimat 4-0 and then edged Smithers 1-0 in a tense shootout victory in the championship game. Charles Hays Secondary School’s (CHSS) boys soccer team are NorthWest Zone champions. The boys are headed to provincials. Charles Hays Secondary School’s (CHSS) boys soccer team won the NorthWest Zone title last Saturday at the CHSS field with wins over Kitimat and Smithers. The Rainmakers edged Smithers 1-0 in an eight-round shootout for the title. Jaibir Sidhu scored the decided goal to an ecstatic Rupert team and crowd. The game was filled with tense moments, but both goaltenders were strong. Josh Reniero was in net for Rupert and made several key stops, including a breakaway attempt in the second half. Rupert had several scoring opportunities late in the game, but couldn’t capitalize. That led to an exciting shootout. Reniero made a couple key saves to seal the deal for the Rainmakers. Ruperto, who is in his second season as the soccer coach, said this team is just that, a complete team. “Any single player can play at any single moment. Every player brings something to the team and we also have some special players that can change the game at any moment,” he said. He praised the boys for how hard they work, practicing six to seven days a week, regardless of if he’s there or not. Zones was a round-robin tournament. However, thanks to Kitimat losing to both Rupert and Smithers, the game between the Rainmakers and Smithers squad turned out to be the deciding one. Rupert beat Kitimat 4-0 in the opening game. Daniel Page and Bailey Melo both scored in that one. It was important for the team to be all over Kitimat and get their confidence up before playing Smithers, said Ruperto. It was a slow season start for the team, losing their first two games. But then they won both games in a tournament in Kitimat a couple weeks ago and kept right on rolling. But the boys will be up against some tough challengers at provincials. Technically, this team is a senior team. But due to lack of players, Rupert is made up of players from Grade 9 through 12, with the majority of the team being juniors. Most other teams are just Grade 11 and 12 players. Despite that, the coach doesn’t see any big holes in the way they play, but experience will give them that extra edge and get them to the next level. “There’s no huge deficit in their game. It’s just learning to play together more. The more games they play, the better they’ll get,” said Ruperto. Nothing is confirmed, but provincials will likely be in Burnaby sometime at the end of November. Ruperto said he will be trying to figure out fundraising to try and get the boys there because they deserve that experience.